And God shall wipe away all tears from their eyes, and there shall be no more death, neither sorrow, nor crying and neither shall there be anymore pain, for it will pass and they shall know peace. 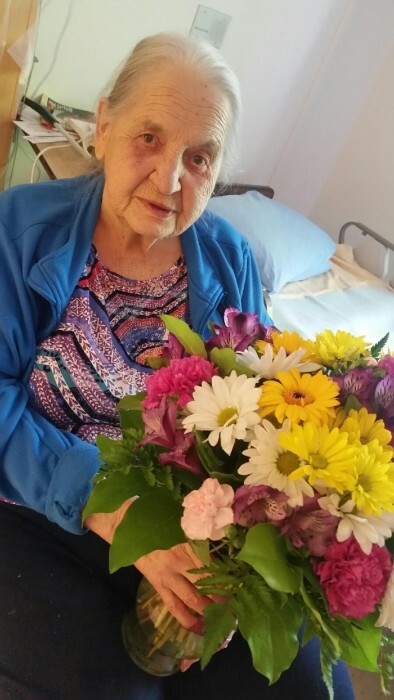 It is with great sadness we announce the passing of our mother and grandmother, Alma Mary Ragan at the Chinook Regional Hospital on February 3, 2019. She was predeceased by her parents, Frank and Mary Bublait, her husband, John Ragan, brother-in-law Ken Bartz and sister-in-law and brother-in-law Betty and Joe Juris. Mom was born on March 25, 1931 in Lethbridge at the Galt Hospital. She was an honest, hardworking, woman who loved the simple things in life. Her love for God and her family meant more to her than life itself. She cherished every moment with her children, grandchildren, great grandchildren, friends and family. Some of her favorite memories are of going to Creston to pick cherries and stopping and fishing along the way. She loved going for drives just to be out in the mountains and fresh air. She will be sadly missed by her children – Leonard Ragan, Jim (Vivian) Ragan, Linda (Sid) Websdale and her grandchildren and great grandchildren – Mandy (Dave), Mackenzie and Kayleigh Shannon, Ritchie (Amber), Kourtney, Scarlet, Isabella and Charlee Ragan, Caitlin and Mitchell Olson, Jesse (Kristen) Ragan, Jaclyn (Brian) and Jade Hamilton, Lyle (Colleen), Kayden, Kiera and Hunter Websdale, Neil (Shelley), Isla and Sydney Websdale, Crystal, Austin and Tyler Maslen and sister Alvinia Bartz and sister-in-law Anne Christiansen. As per Mom’s wishes, there will be a private funeral.